I really want to make sure that my furniture is sited to appreciate the beautiful spring-time view of the gardens. Well the time is drawing near! The Empty House Party is today, so I feel like I can begin talking about my process. 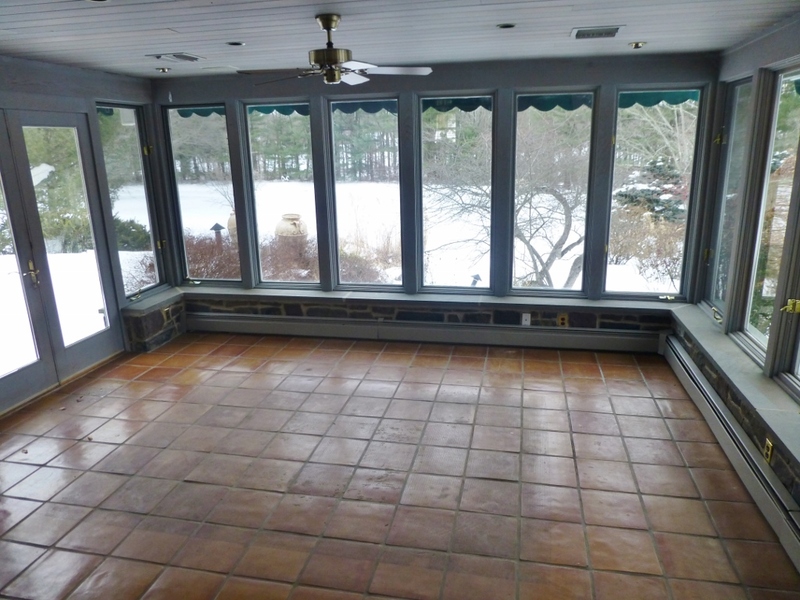 Let me start by walking you through my designs and ideas for the space and once again sharing a ‘before’ image of my sunroom area. You’ll remember from my last post that the space is roughly 13′ x 16′ and has windows (and French doors) on 3 sides. Visitors to the designer house will enter my space from this direction after leaving the kitchen, which is sited 2 steps above the floor of the sunroom. A few things really caught my eye when I first visited this space. 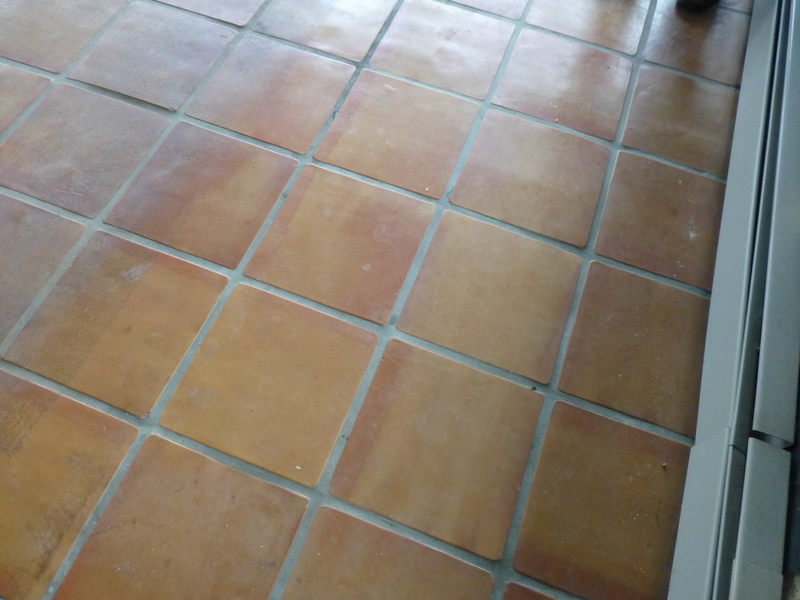 The first is the terra-cotta floor. I will cover most of this with an area rug, but there will still be glimpses of it around the perimeter and to one side, so I need to make sure I address that in my color scheme. Second, the view will be amazing! In these photographs, all you see is snow, but by the time the designer house opens to the public, the grounds will be transformed into a visual delight (the landscapers do an amazing job–it’s incredible!). So I really want to make sure that my furniture is sited to appreciate the beautiful spring-time view of the gardens. The view out the right corner of the sunroom features the pool and pool house below. 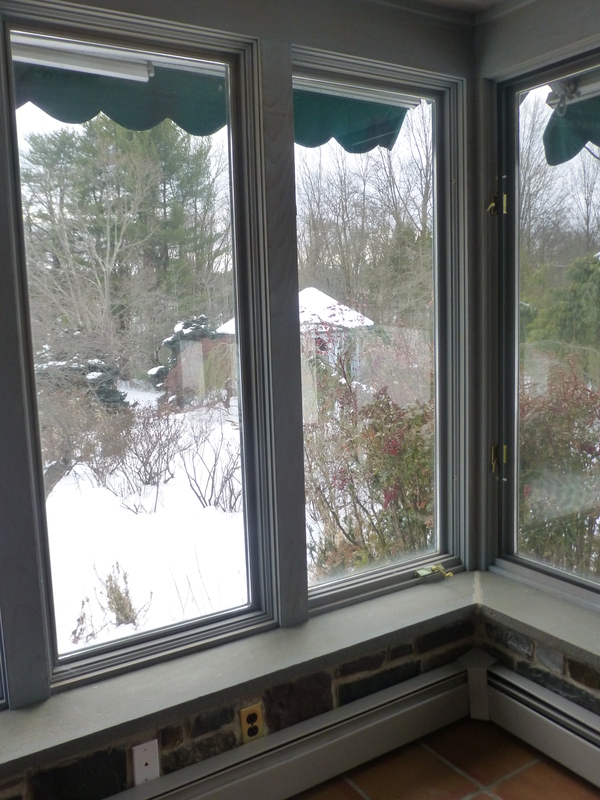 Other windows look out onto the pond and French doors open out to the patio on the opposite side of the room. I also want to be rid of that ugly ceiling fan, so I need to figure out a pretty fixture to go there. Since visitors will step down into the room from the kitchen, they will really notice whatever is mounted on the ceiling (it’s at eye level when you’re standing in the kitchen) and the ceiling fixture will definitely become an important design element. 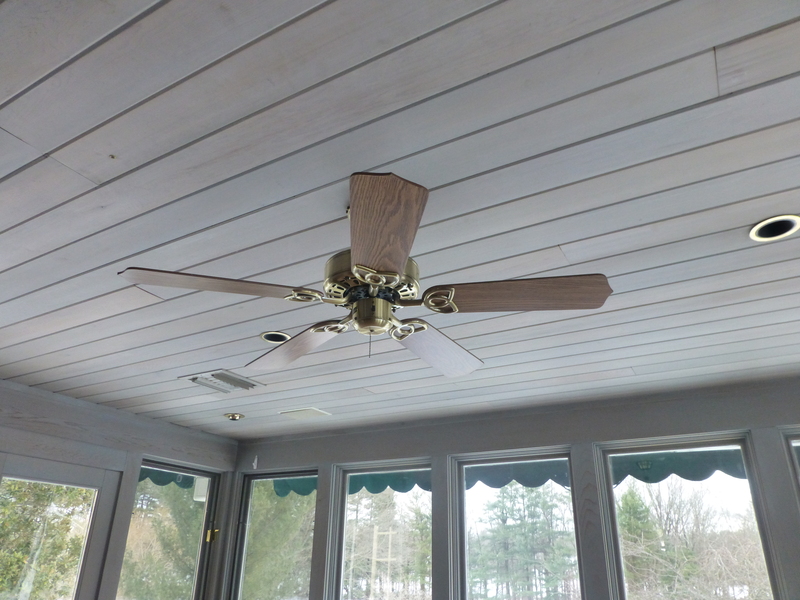 The dated ceiling fan will definitely have to go, but check out the lovely stained woodwork. I really like the gray, don’t you? Did you notice the bold green scallopped awnings peeking out at the top of the windows? They’re in questionable condition…so I’m hoping the landscapers will be removing or refurbishing them. But I need to plan on shielding them from view, just in case…so valances are definitely in order here. 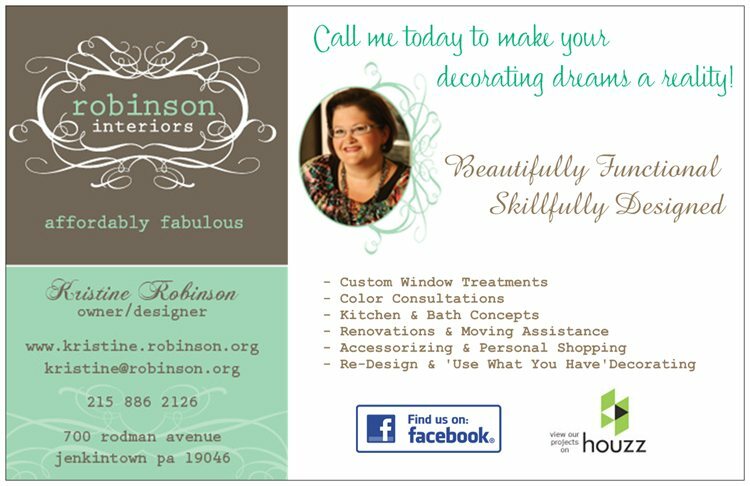 Plus, as you probably know, I am a window treatment and fabric fanatic. I believe they have so much power in the design of a room! Fabric will soften these windows and tie everything together beautifully. I often see full-length wispy-sheer draperies in sunroom photos, and I love that look, but you’ll notice there’s a 10″ deep ledge at the bottom of the windows that runs nearly all the way around the perimeter of the room. So I won’t be doing that…plus, full-length draperies wouldn’t do anything to cover up those awnings either. As a result, I’m spending a lot of time brewing about the style of valance and which fabric I’ll use. Any ideas? 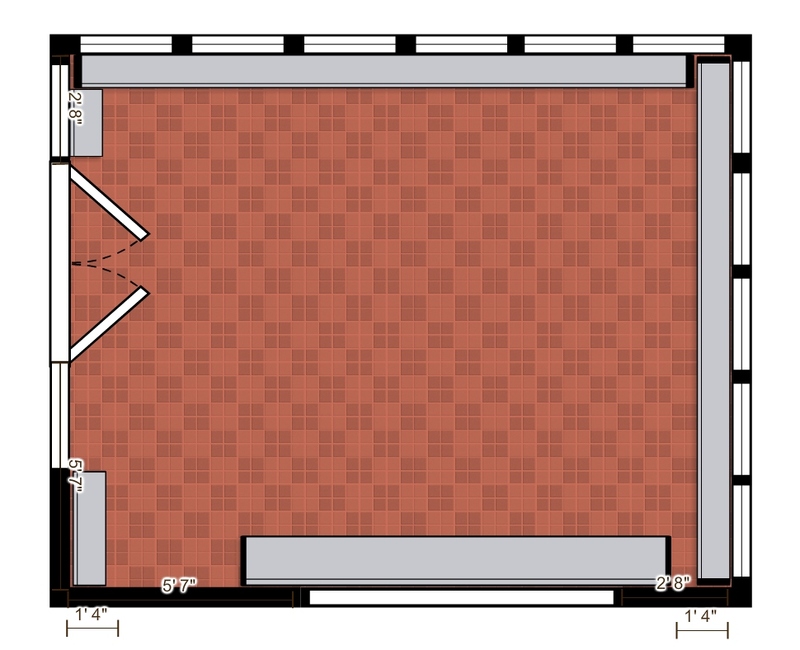 Finally, I did a scale rendering of the floor plan, so I can start playing around with the furniture layout. My scale rendering of the sunroom floor plan. Next time I’ll share more about my plans for the furnishings and layout. I’ll walk you through my thought process and give you an idea of how these things evolve. Thanks for taking the time to read my posts, and please feel free to leave your own ideas and comments. I’d love to hear what you think about the room, and how you’d envision the space to look. This is the fun part, don’t you think? This entry was posted in Benefit, Bucks County, Color, Decor, Decorating, Designer House, Gardens, Home, Home Decor, Interior Design, Interior Designer, Sunroom, Uncategorized, Window Treatments and tagged Bucks County Designer House, Ceiling Fan, Draperies, Floor Plan, Garden, Interior Decorator, Interior Designer, Landscape, Layout, lighting, Robinson interiors, Terra Cotta, Tile, Valances, View, Windows. Bookmark the permalink.